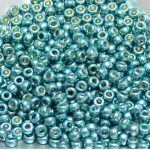 Are you ready to begin making jewelry that is more than just a single strand of beads and a clasp? I love the simplicity of a single strand of beads, but sometimes I want MORE. More strands means more complicated, right? Well, yes. You were hoping I would say it’s easy, right? Well, no. But, I can offer some tips that will help you create a simple, graduated length necklace with three strands. Choose your beads, then choose some more. My sample necklace has three strands which started out as the standard 16” length that gemstone beads come in. If I want to make a graduated strand necklace, this means that the longest strand will be about 17” by the time I add a clasp. This means that the shortest strand will be somewhere around 14”, an appropriate size for a teenager, but not for my middle-aged neck. So, I needed to add some more beads. In this case, I added tiny 2mm silver plated round beads and 4mm Swarovski crystal bicones. Use a bead design board, but in an unusual way. The outer groove in a design board is the only groove that the measurement marks apply to. So, to get a good estimate of length, lay out your INNER strand in the OUTER groove. String it up. Check your length. Then, MOVE this strand to the inner groove. Now when you design the other two strands, you will just simply include enough beads so that the ends of all three strands line up with each other. That’s it. String them, check your length again, and attach your clasp. The distance between the grooves will be the distance between the strands. The design board has about ½” between the grooves. If you use the board as described above, this will be the distance between the strands of your finished necklace. If you want that to be less, then you’re simply in for some trial and error to get it done. Sorry, I don’t have an easy tip for that one. Just ask our expert Michelle about the time she created a 5 strand pearl necklace, and you may catch her sucking in her breath in that moment before she smiles sweetly and tells you how you can do it too. About the Bead Choices: I started out by choosing a strand of beads that is beautiful, but a little drab on its own. The flashes of blue and green that make it shimmer in the light is called Labradorescence. This particular strand of 4mm round beads limits this color play to the brightest of light. Labradorite is mostly gray, but once I started really considering this strand, I could see that it was really a brownish gray. The brown tones are what make it a “warm” gray, so I focused my other bead choices on warmer, earthier tones. Next, I chose some green freshwater pearls that brought out the green in the labradorite, yet offered plenty of brown tones to complement the browns in the labradorite. The third strand is pale, almost clear, aquamarine ovals. They needed something to bring out the color, so I added some erinite color Swarovski crystal bicones and repeated them in the labradorite strand as well to help bring out the blues and greens. 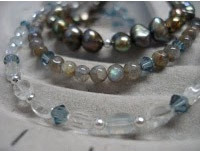 The 2mm silver beads bring sparkle and light into the pearl strand and the aquamarine. Would you love to learn more about this and other kinds of multi-strand designs? I will be offering a class at the shop on December 17th. We will make a three strand project like the one featured here, as well as discuss ways to create other kinds of multi-strand necklaces using connectors, cones, and more.